I rarely go onto Facebook anymore to connect with current and old friends, but for some reason, I do regularly look at other people’s shoes on Instagram. Maybe I prefer shoe photos to photos of someone’s dinner. The other night I was travelling home and checked out my Instagram feed. I was amazed with the photos of the work people had put into their shoes. It was inspiring. Also inspiring are the entries on the StyleForum 2018 Shoe Revival Challenge. A lot of passion and talent on display there. Check it out. 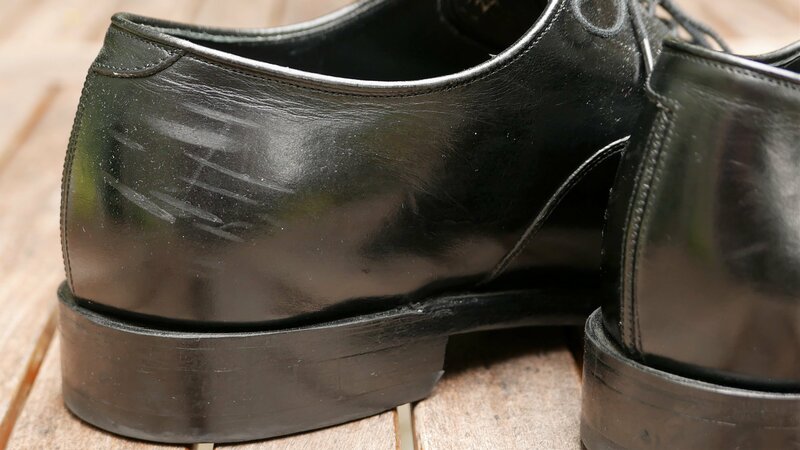 And the not-so-vintage shoes in this article are a pair of calfskin Johnston & Murphy Crown Aristocraft Georgetown II cap toes. Model 24-4971. I am going to go ahead and admit that this pair was made in 2012. Yes, the 21st century. “But … but … this is vcleat”. I know. But it’s true. Deal with it. I regularly wear the pair on my business trips. This was how the pair looked at the end of a recent trip. Tired. Evidently, I have trouble walking. Check out the self-inflicted damage on the insides of the shoes. Maybe there was some drinking involved. Entertaining customers is tough work. Just giving the pair a brushing and wipe made them look much better. But why stop there? 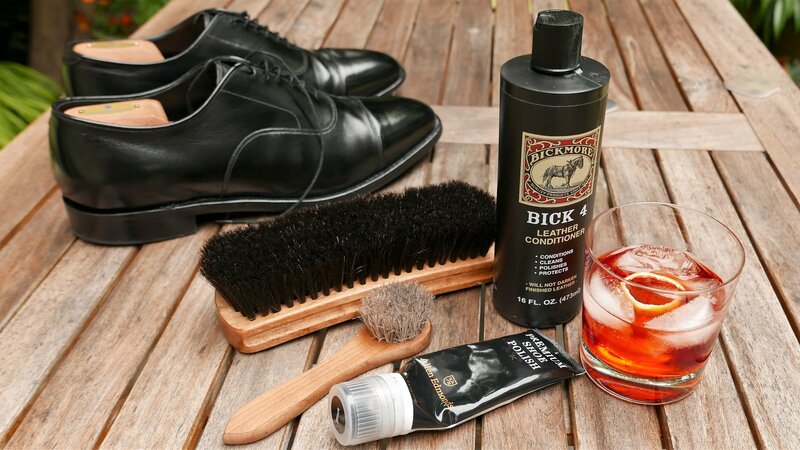 Bickmore Bick 4 is my go-to product when it comes to calfskin. And many other leathers. It’s an easy product to use and works well. It gives some shine as well but it’s not a polish. 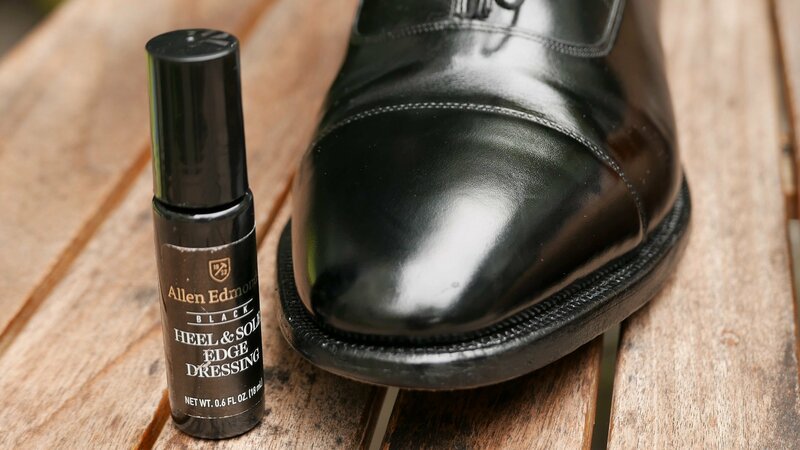 I also like the Allen Edmonds premium shoe creams and I gave the pair one round of black shoe cream. I hate the sponge applicator on the AE creams though. It is awful. Or I am awful using it. I open the cap and apply it with an old t-shirt. Slack challenges me as well. Doughnuts do not. 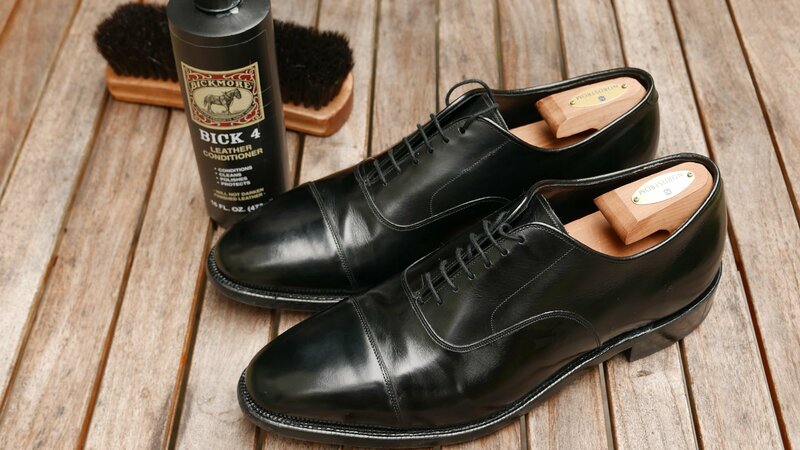 To fix the roughed-up areas on the inside of the shoes, I gave the leather a wet sand using 3600 grit sandpaper with Bick4 as a lubricant. I buffed the areas and followed it with black cream polish. 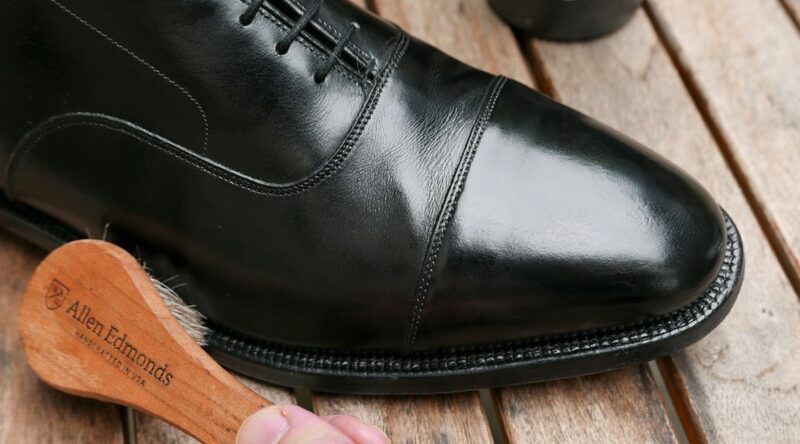 Smooth black calfskin is probably the easiest leather to fix with this wet sand method. I followed all the polishing with edge dressing. I did not do a mirror shine but a cap toe is a perfect shoe for it. A mirror shine is just too much bling for me. I am getting old. Or less young. Either way, the shoes are ready for another trip. Do you prefer to look like a well-dressed adult? Do you believe Lee Harvey Oswald acted alone? If you answered “yes” (or “yes!”), to either question, then you passed. Congratulations. Now you must buy a pair. 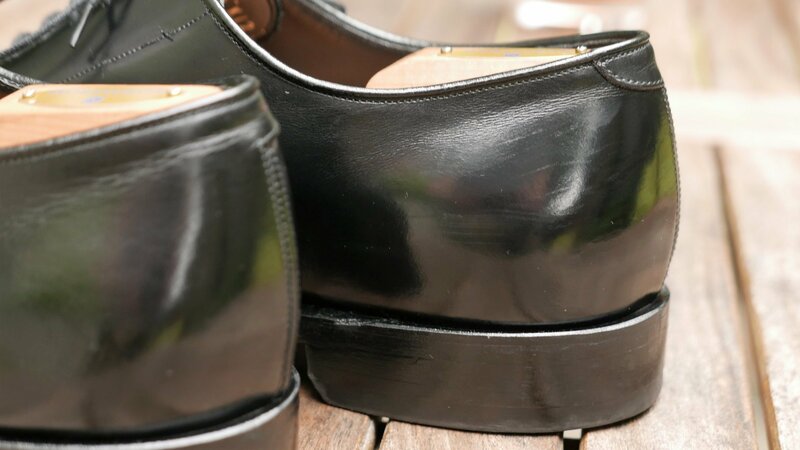 Black cap toes are the perfect business shose and appropriate at any event outside of aquatic facilities. 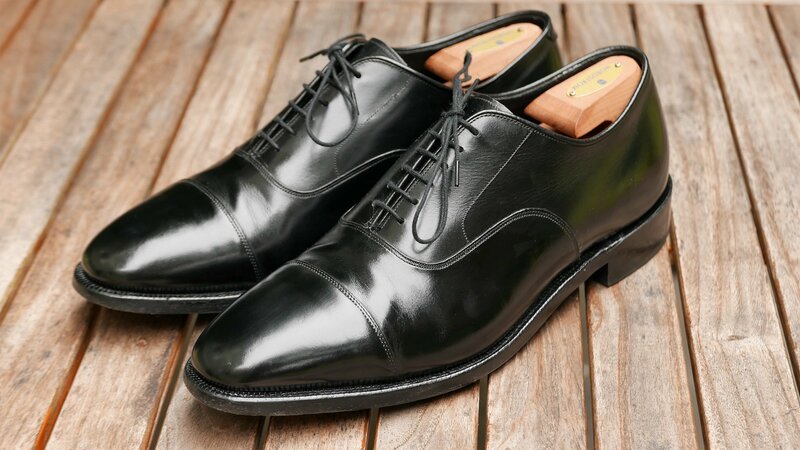 If you do a bit of research (Google it), you will find many articles listing a black cap toe as one of the five shoes every man should own. You will also find that all these articles are plagiarized from each other. Their collective bibliographies would be like an Escher drawing. And the articles are click bait. 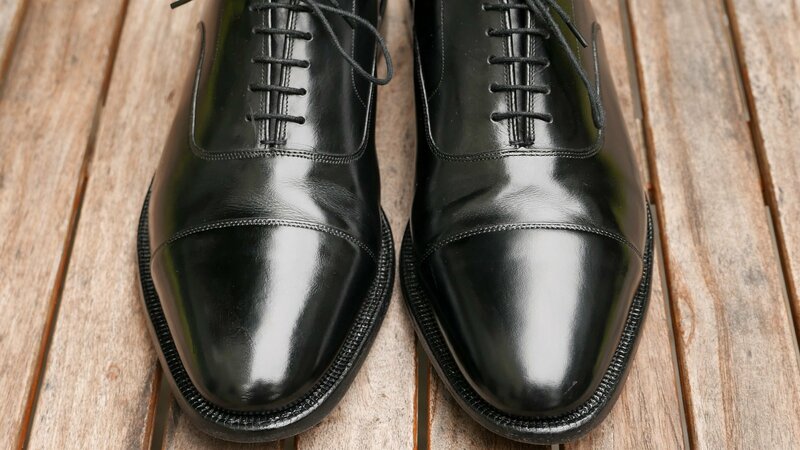 If I was smart, I would have titled this article, “Top five shoes every man must own. You won’t believe number four!”. That would bring in the traffic. This Crown Aristocraft pair is my favorite cap toe. I prefer the shape and design over the Allen Edmonds, FootJoy and Alden cap toe pairs I have owned. The length of the cap toe in proportion to the rest of the shoe seems perfect to me. And having six eyelets instead of five gives it a more formal appearance. 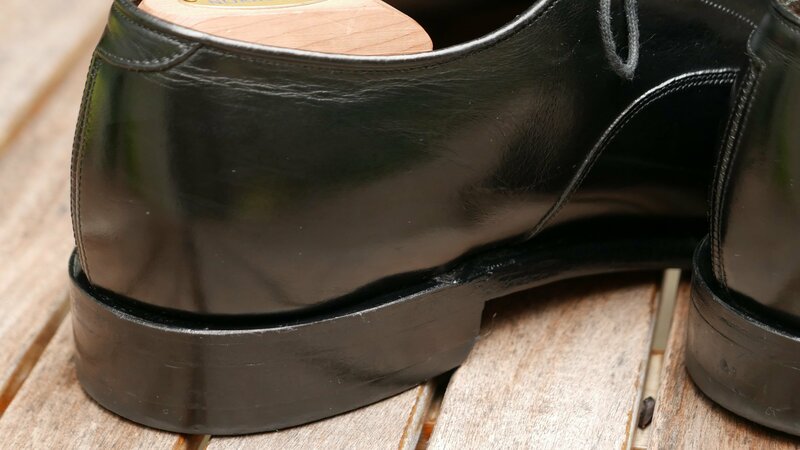 The pair is Goodyear welted and fully leather lined. Of course. 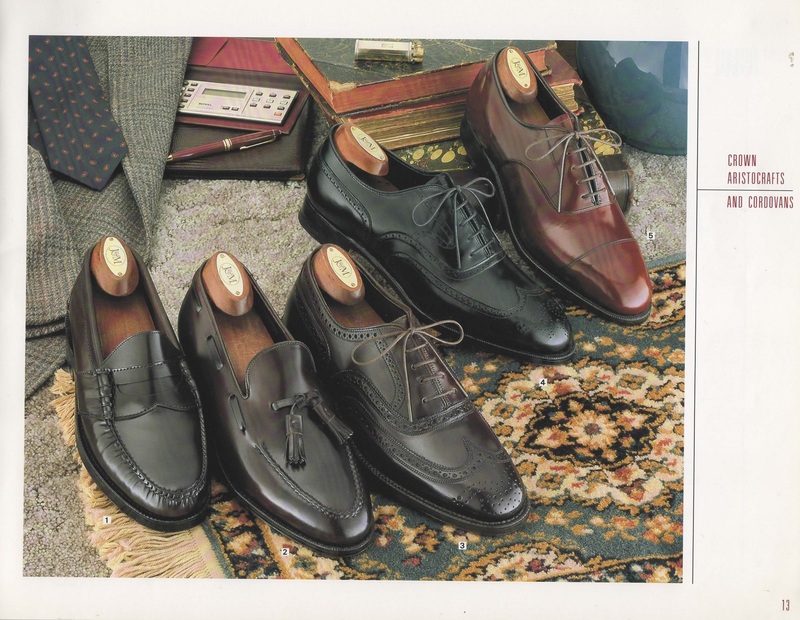 Johnston & Murphy has been making the Georgetown II since the 1980s. What was the difference between the original Georgetown and the Georgetown II (other than the cool Roman numerals)? I don’t know but probably not much. The Georgetown II is one of the few remaining made in USA models. I had heard Johnston & Murphy was ending production of the Crown Aristocraft line but as of today, I still see pairs being sold on the J&M website. Johnston Murphy 1987 Catalog. Burgundy Georgetown II is in the upper right. I always looks forward to your posts. The sandpaper with bick4 appears to yield terrific results. I have some shoes that could use a treatment like this so thanks for that. You also now have me looking for a pair of Georgetowns. How did you date them as 2012? Can you post a picture of the soles and insoles? The tongue has a date code of “K12”. So November 2012. 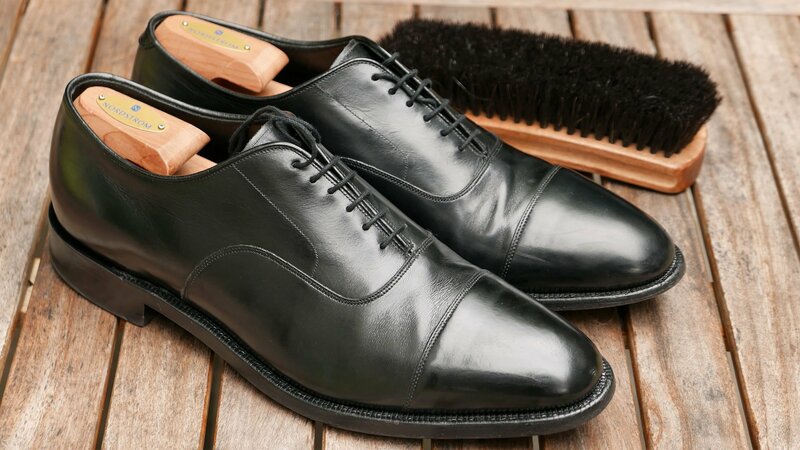 All the modern J&M shoes use a month-year combo like this. Guess mine must be older. Besides the style number and size. It has 51986 /2 and 906N written on the interior lining. Nothing on the tongue. Wonder if that means June 1986? The logo on the interior heel pad has Johnston & Murphy written from heel to toe in block type with a line above and below . Above the top line is the crown and winged animals logo, and below the bottom line is Crown Aristocraft. The logos on the soles are in wear areas and not as close to the heel as is sometimes the case. 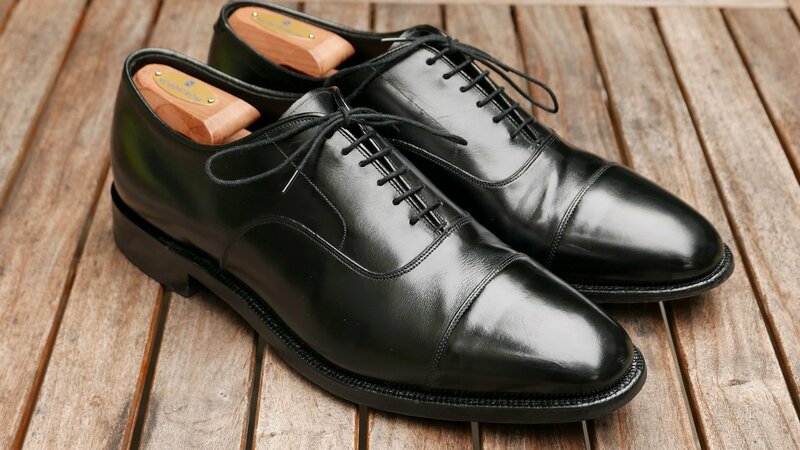 I think they are quite similar to the Alden’s Hampton lasted cap toe shoes. For me a better last than AE’s 5 last. One point of interest is I can really feel the presence of the steel shank and heavier arch support. I believe 906 is a data code in this YMM format. So June 1989 or 1999. I agree about the Hampton last. I have a pair of modern AE Park Ave in brown that I bought new two years ago. Comparing my Georgetown II to the AE, the J&M leather and stitching is better. At least in my versions of the shoes. Until you own 7 pairs of black toe caps, you cannot call yourself an adult. I can assure you, that Queen Elizabeth refuses to entertain anyone with less than 5 pairs of black toe caps. In fact, she will refuse to colonize anyone with less than 7 pairs. If you want to join your neighbours to the north, I strongly recommend you start building your collection accordingly. Great article, by the way. Now I have a new way to deal with scuffs. Maple syrup doesn’t seem to do the trick. Hi David – Are you saying you used sandpaper on the calfskin itself? 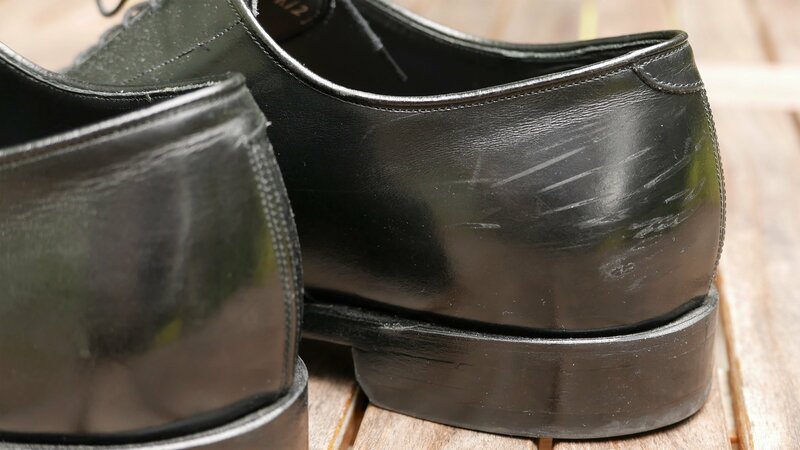 On the scuffed heel areas? Thanks. I agree with you – the proportion of cap to shoe on this model is spot on. Yes. I sanded the calfskin. 3600 grit is not very abrasive. David is the first word, and the last word on shoes. I will deploy this method for scuffs. 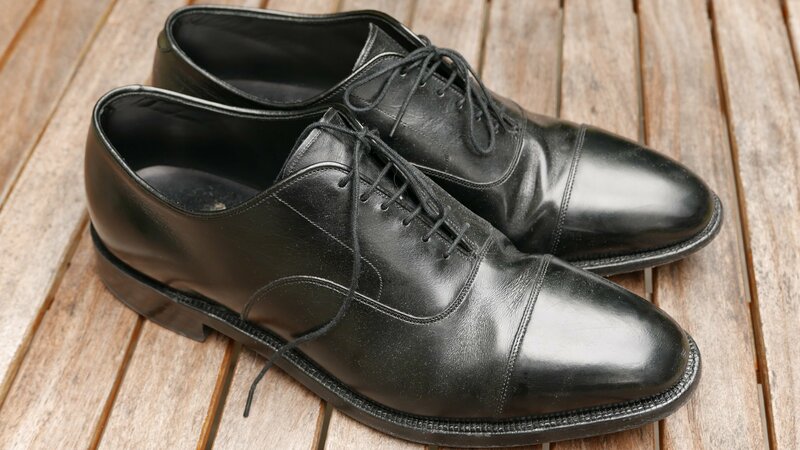 I recently picked up a pair of Johnston & Murphy Crown Aristocraft Georgetown II captoes in black off Ebay for $30. They were store returns and look brand new. At first I thought they were slightly lesser in quality than my Allen Edmonds but after wearing them a number of times, and comparing them to a friends Park Ave AE’s I think the J&M wins on style and substance. The stitching is noticeably neater and we both prefer the length of the captoe. Mine have the date code of G15, so thats July of 2015, correct? Also I have a pair of AE Leeds in Shell coming that I hope clean up as lovely as yours did! Wish me luck! That was a great deal. Yes, on the date code. Great deal on the JMs. I am jealous.